Passive Infrared Sensor (PIR) is very useful module, used to build many kinds of Security Alarm Systems and Motion Detectors. It is called passive because it receives infrared, not emits. Basically PIR sensor detects any change in heat, and whenever it detects any change, its output PIN becomes HIGH. They are also referred as Pyroelectric or IR motion sensors. Here we should note that every object emits some amount of infrared when heated. Human also emits infrared because of body heat. PIR sensors can detect small amount of variation in infrared. Whenever an object passes through the sensor range, it produces infrared because of the friction between air and object, and get caught by PIR. The main component of PIR sensor is Pyroelectric sensor shown in figure (rectangular crystal behind the plastic cap). Along with this, BISS0001 ("Micro Power PIR Motion Detector IC"), some resistors, capacitors and other components used to build PIR sensor. BISS0001 IC take the input from sensor and does processing to make the output pin HIGH or LOW accordingly. Pyroelectric sensor divide in two halves, when there is no motion, both halves remain in same state, means both senses the same level of infrared. As soon as somebody enters in first half, the infrared level of one half becomes greater than other, and this causes PIRs to react and makes the output pin high. Pyroelectric sensor is covered by a plastic cap, which has array of many Fresnel Lens inside. These lenses are curved in such a manner so that sensor can cover a wide range. We have built a very simple Motion detector circuit here. We are using a HC-SR501 PIR Sensor, an LED (which will glow whenever there is a motion infront of the sensor) and resistor. Vcc PIN of PIRs connected to the positive terminal of the 9v battery, GND pin is connected to negative terminal of battery and Output pin of PIR is connected to LED with a resistor of 220 Ohm. When there is any motion in the range of PIRs, LED will start blinking. PIRs takes some time to stable itself according to surrounding conditions, so you can find, LED turn ON and OFF randomly for about 10-60 seconds. Now when we find the LED blinking whenever there is any motion, look back of the PIR, you will find a jumper which is placed between outer corner PIN and middle PIN (see diagram above). This is called “non-retriggering” Or “Non-repeatable trigger” and jumper said to be in L position. In this position LED will blink continuously until there is motion. Now if you connect this jumper between inner corner PIN and middle PIN, then LED will stay on all the time till there is any motion. This one is called “retriggering” or “Repeatable trigger” and jumper said to be in H position. There are two potentiometers (shown in above figure), used to set the time delay and distance range. Time delay is the duration in which the LED will remain ON (out pin HIGH). In Non repeatable triggering, OUTPUT will become low automatically after the time delay. In Repeatable triggering OUTPUT will also become low after time delay, but if there is a continuous human activity; OUTPUT will remain HIGH even after the time delay. Turn the Distance Adjustment potentiometer clockwise rotation, increased sensing distance (about 7 meters), on the other hand, the sensing distance decreases (about 3 meters). Turn the Time delay potentiometer clockwise rotation sensor the delay lengthened (600S, 10 minutes), on the opposite side, shorten the delay (0.3 second). Generally PIR detects infrared of 8 to 14 micrometre of wavelength and has range of 3-15 meters with a field of view less than 180 degrees. This range can vary upon different models. Some ceiling PIRs can cover 360 degrees. PIRs generally operate at 3-9V DC. What is the range of a PIR sensor? I am not getting you, this circuit is already working as per your need. The LED/alarm gets only activated in human presence. I wish to understand, can this circuit not be used in a room? What I mean is, in a room, you may have other things that generate heat light fan, refrigerator, TV set and you can also have an Air conditioner. In such a situation, can the system work very well? Or should it be limited to work only on passage ways and stair case? sir..can you make it turn off when the person exits the room? when the person enters the room, the sensor detect the person and turns on the light, and when the person gets out from the room, the sensor detect the person and turns off the light. im trying to make this for my bathroom light, can you help me? 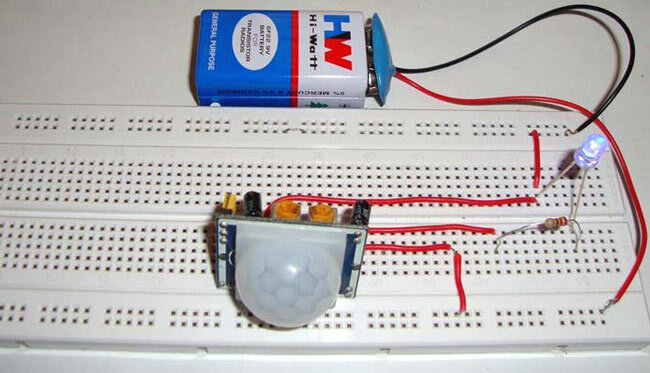 how to make,when pir detect motion then all alarm should ring continouse till we switch off and on pir circuit. it is because the pir ring buzzer for very short period. Read the working of PIR sensor carefully, you can increase the Period by using the Time delay control knob. I want that when my sensor detects it turns on the alarm and alarm should remain on till alarm 3-4 minutes. You can set the time delay using Time delay potentiometer, upto 10 minutes. Please read the article carefully. we are facing color wire interchanging problem in our process, we need correct color presence or not identification by using simple circuit,it is possible pls send me quote to my email id along with project details at soon. SIr plz tell me the price of PIR sensor, And Where I purchase it. what will hppn if some small creature or animal in front of a sensor ??? Can I use 12V Battery??? Hi friends Does anyone have the pcb file of the sensor module in the image? Can you share? motion sensor turns the light on if there is human action...but does not when human present in the room but without any movement...how to solve this issue ..how to write code for this ..?? please reply as soon as possible.. I have a question, does it work with a light and alarm or can it be connected to both? When someone enters, the light on and the alarm goes on as well,..
And can it be connected on the fence of a house? You can use the output pin of the sensor to drive any load you want. The load might be Light Alaram ar anything that you desire. But you should design apprpriate driver circuit for it. Hi Aswinth , Hope you are doing good . Can we increse its range?? if i have to use more than 1 PIR sensor in my circuit can i draw 5 v power for each using only 1 5v power pin on arduino . I need Complete Block circuit of This PIR sensor . can you please share that with me . Is there one specific resistor which can be used for the PIR sensor or is a there a number of resistors which can be used for the PIR motion sensor ?, if so what are the names of the resistors ? can someone provide me with a circuit for making a PIR sensor for human detection? Please how can I incorporate a delay system to this PIR so that it doesn't come on immediately it senses the motion. I want a system that will have a delay of 30seconds before the PIR triggers the LED to be HIGH?